An elderly couple is trying to track down the person who left them an anonymous letter criticizing the curb appeal of their Ocean City home. Bill and Barbara Doughten, who are both in their 70’s and have lived in their home for decades, say they received a handwritten letter on Tuesday, seemingly from a real estate agent. “I'm trying to sell million dollar homes in the neighborhood,” the anonymous person wrote. “I drive my clients around and they see your car parked sideways on the front lawn! You have a driveway - use it!" Bill and Barbara say the letter had no return address or signature. The couple’s grandchildren posted the letter on Facebook where it’s since been shared more than 700 times. Bill says he parks his car on the lawn because the grass is closer to the front door when he brings in his groceries. 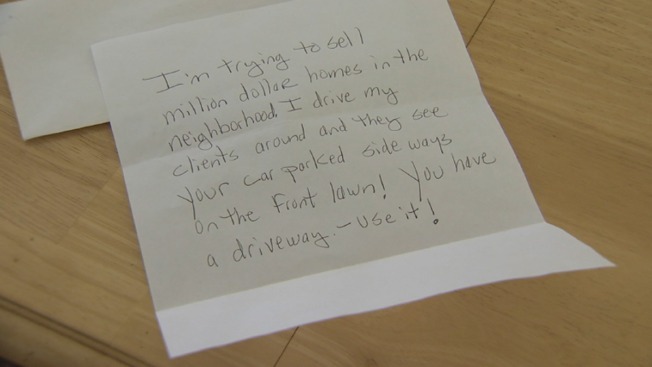 Jeff Quintin, a real estate agent with Berkshire-Hathaway Fox & Roach Real Estate, told NBC10 that while he and his fellow agents prefer that homeowners not park on their lawns, angry anonymous letters are not the way to spread that message.